Donemana travel to Limavady United/Drummond this Saturday. Lisahally moved further clear at the top of the Premier Division after a 5-2 home win over BBOB another side badly needing points are Lincoln Courts and they got three on Saturday with the only goal of the game at Limavady United Drummond. Draperstown continued their move up the table with a 4-0 home win over bottom club Tullyally. There are four fixtures down for decision in the Premier Division this Saturday. This has to be the match of the day, the home side have opened up a big lead at the top of the table and now look odds on to win the title, they just don’t know what its like to lose a game such is their confidence. Draperstown will know that anything less than three points would surely end their title hopes, they sometime fail to replicate their home form on their away trips the home side to go marching on. The Roesiders suffered a shock defeat last Saturday which ended any slight hopes they may have had about catching Lisahally, they must now regroup and try for a top four finish. 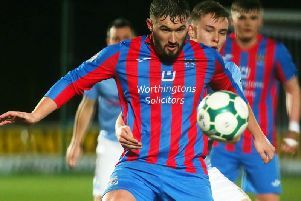 Donemana were without a game last week so their players will be looking forward to getting back to action, they have the players that on their day are as good as anything in the division and with Ricky Lee Dougherty leading their attack they may collect the points. The Old Boys are still not out of the woods as regards the fight to avoid the drop, after a good result the week before they went down last week. They will keep fighting to keep themselves in the top flight. Wanderers have games in hand over some of the clubs that are above them that said they know that points on the board can make all the difference, they should get three here. Yet another defeat for the Tullyally men last week, they are starting to run out of games and they are playing like a side who have already accepted their fate, if they do go down they can start to rebuild. The Courts had a great win at Drummond last week and that result will give them hope that they can move up the table, they know however that they need another couple of wins this could be one of them.